In the modern fleet, with an average length of 75- to 90-feet, these boats were the largest of the sampans. The pole-and-line fleet generally fished within a few miles of the main Hawaiian Islands, because few vessels carried ice and the catch needed to be landed within four to five hours from the time of capture. The modern fishing method used live bait thrown from a fishing vessel to stimulate a surface school into a feeding frenzy. Fishing was then conducted frantically to take advantage of the limited time the school remains near the boat. The pole and line were about 10-feet and used a barbless hook with feather skirts which is slapped against the water until a fish strikes. Then the fish is yanked into the vessel in one motion. The fish unhooks when the line is slacked so that the process can be repeated. On a pole-and-line vessel a fisherman was required to learn how to cast the line, jerk the fish out of the water, catch the tuna under his left arm, snap the barbless hook out, slide the fish into the hold and cast the line back out – all in rapid succession. The fishery was dependent on having sufficient bait fish, nehu (Hawaiian anchovy;) a lot of the bait fish, came from Kāneʻohe Bay. Dozens of aku boats would set their nets in the Bay’s shallows; the pier at Heʻeia Kea Boat Harbor was homeport for more than 20 of them. Initially, most sampans docked in Honolulu Harbor. In the 1920s, Kewalo Basin was constructed and by the 1930s was the main berthing area for the sampan fleet and also the site of the tuna cannery, fish auction, shipyard, ice plant, fuel dock and other shore-side facilities. The Hawaiʻi skipjack tuna fishery originally supplied only the local market for fresh and dried tuna. Then, the Hawaiian Tuna Packers, Ltd. cannery was established (in 1916,) enabling the fishery to expand beyond a relatively small fresh and dried market. Six sampans made up the cannery’s initial fleet. The fleet grew and before WWII the fishery included up to 26 vessels. Following the war, as new vessels were built, fleet size increased to a maximum of 32 vessels in 1948. These vessels carried crews of 7-9 fishermen, and frequently worked 6 days a week. It was hard work and the fishing day may begin with catching bait fish at dawn, followed by fishing to dusk. 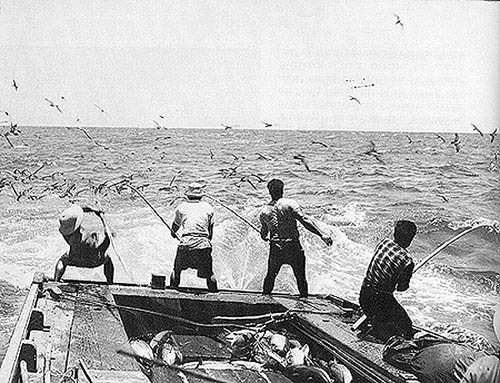 Historically, the pole-and-line, live bait fishery for skipjack tuna (aku) was the largest commercial fishery in Hawaiʻi. Annual pole-and-line landings of skipjack tuna exceeded 5.5 million lb from 1937 to 1973. The new and expanding market for canned product allowed the fishery to grow; from 1937 until the early 1980s most of the skipjack tuna landed in Hawaiʻi was canned. F Walter Macfarlane opened the Macfarlane Tuna Company at Ala Moana and Cooke street. By 1922, after having changed hands a couple times, the company was incorporated by local stockholders as Hawaiian Tuna Packers Ltd.
Around 1928, tuna processing started in Kewalo Basin. Nearby was the Kewalo Shipyard that serviced and repaired the local aku boats. They also had an ice house. From the beginning, Hawaiian Tuna Packers label was Coral Tuna or Coral Hawaiian Brand Tuna. By the 1930s, the Honolulu cannery employed 500 and produced nearly ten-million cans of tuna per year. For several years Hawaiian Tuna Packers also operated a smaller cannery in Hilo. In 1960, Castle & Cooke bought out Hawaiian Tuna Packers and made it a part of Bumble Bee Seafoods out of the northwest. They operated the cannery until late-1984, when it ultimately closed.